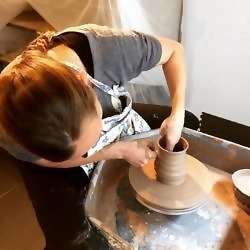 My pots are carefully handcrafted on my potter's wheel and each is unique. Some might come as a 'family', but they are not factory-made, so the sizes and shapes, though similar, will vary slightly. I mostly throw with high-fire white stoneware clay. All of my glazes are of my own creation and are composed in large part from natural materials from the Yorkshire Dales. I forage for plants such as nettles, thistles, common hogweed, docks and rushes, and then burn and process the ashes for ash glazes. Wood is sourced from Ribblehead Forest. I collect iron ochre around the skirts of Whernside and source greywacke gritstone dust from Dry Rigg Quarry at Horton-in-Ribblesdale. All of these are used in various combinations to produce the glazes that I use. Wheel-thrown pottery. Natural (Yorkshire Dales) glazes.